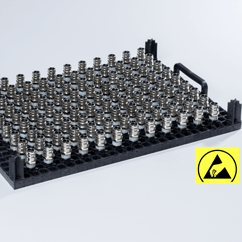 ESD tech-rack variogrid – variable workpiece carrier, which protects the sensitive electronic components from electrostatic discharge during the entire production process. ESD tech-rack variogrid is a modular workpiece carrier system. It is used both as an insert in a regular basket or divider rack, and as a stand-alone workpiece carrier. Electronic components could be destroyed from electrostatic discharge. To protect from such damage, we have developed the tried and tested workpiece carrier tech-rack variogrid in an ESD embodiment as well. It reliably prevents electrostatic charge generation and dissipates any existing charge in a controlled way. In this way, higher production costs and lower production output could be prevented. ESD tech-rack variogrid combined the advantages of plastic workpiece carriers with the design of a metal lattice bottom. With numerous rotating and plug pins, a component-adapted configuration is possible. Numerous customized configuration options: the stacking pins can be placed in any manner on the lattice to ensure stackability in any size. Safe handling: shaped in a user-friendly way according to ergonomic principles.